I admit I’m surprised by the question. The girl is no more than fifteen, sitting quietly among other students her age at a secondary school in Gaza. They’re all members of the school parliament – a student body elected by peers and representing them in discussions with school management. I’m with a couple of UN staff and we’ve just spent the past 45 minutes asking them about their activities. They set up peer mediation groups for students with disagreements; they coordinate trips to local organizations, including visits to the elderly; they raise funds to help poor students; they provide support to students traumatized by the latest rocket attacks back in November; they help students with their homework; they keep the school clean. They are articulate, enthusiastic, and eager to talk about their accomplishments. They even put on a slideshow partway through. 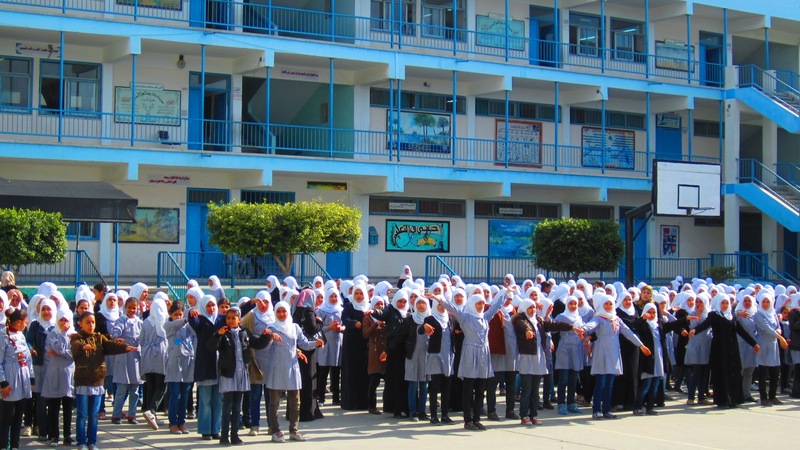 Girls at a secondary school in Gaza. I pause a moment before answering the girl. “No,” I say, “not everyone thinks that. My friends and family know a lot about Palestinians and of the suffering that they are going through. They ask me what your lives are like; they ask me how a peaceful solution can ever become a reality. They are genuinely interested in seeing you live a life of dignity, and we all know that the actions and words of those in power – anywhere – are not necessarily a reflection of the hearts and minds of the people who must live by their rules.” Part of my answer is a copout; it’s too easy to rely on what friends and family think because they are sympathetic to Palestinian autonomy and freedom. But I withhold speaking about the more nuanced reality that exists, one in which many people are divided on their (often strong and ill-informed) opinions about Palestinians. The girls I meet are hopeful in a place that is rotten, broken, smashed, bombed, cracked, patched together, and filled with garbage on the streets. Nearly every street corner has a weather weary poster of a martyr brandishing a machine gun looking very Rambo-epic and ready to die. Turn the corner to walk into a school and you see walls plastered with malformed paintings of SpongeBob, Mickey Mouse and Papa Smurf smiling right at you. The juxtaposition of violence and fear with happiness and a safe learning environment is enough to mess anyone up; that the girls still have hope is nothing short of miraculous. I don’t know if my answer means anything to them, but they need to know that their hope has to lead them to a better life. Your blog posts are always so moving… and so interesting ! Your blogposts are always so moving… and interesting!